Tips for crafting quality wine at home. At RJS Craft Winemaking, we love what we do … and we’re certain that once you get started, you’ll love it, too! Home winemaking is easy. These simple tips will make it even easier and ensure that your winemaking experience is the best it can be. When you start making your own wine, don’t just grab anything you see around the house. Items that are not sanitized properly will taint your wine. 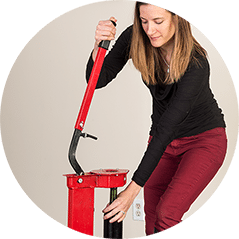 Proper winemaking equipment is made of food-grade plastic to give you the best results possible. Your retailer will help you select the equipment you need. It’s important to use the correct size equipment. 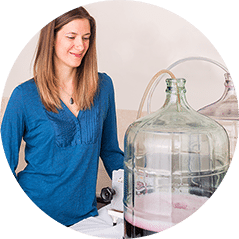 During the primary fermentation you should ferment in a container at least half as big as the quantity of juice you are trying to ferment to allow the aerobic part of the fermentation to happen successfully. The fining stage should take place in a closed container with minimum headspace. 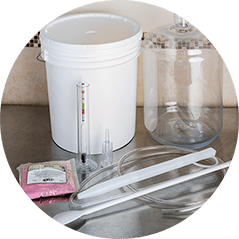 Clean and sanitize everything that touches your wine – fermenters, carboys, hoses, thermometers, spoons. It’s easy and worth it: 90% of winemaking failures can be traced to poor cleaning or faulty sanitation. Use an unscented detergent and clean all visible residue off your equipment. To sanitize your equipment, treat it with a substance that will inhibit or kill bacteria, such as a metabisulphite solution. There are several to choose from and they all work a little differently. Ask your craft winemaking specialist for advice. We recommend sprinkling the dry yeast over the surface of the juice (at 18 to 25º C) and not stirring. If the temperature is wrong, the yeast won’t be happy. If you stir it in, you can suffocate it. Sulphite prevents your wine from spoiling, so please don’t leave it out. Wine without added sulphite may have a shelf life as short as one month. Sulphite will help prevent a lot of nasty things that can happen to your wine, such as oxidizing or vinegar bacteria. Eventually you need to clear your wine. You do this by adding natural substances like chitosan, keiselsol, and a clay called bentonite. These come with the kit and need to be dispersed thoroughly in the wine. This means stirring … and stirring … and stirring. The hard work will pay off! To prevent your wine from oxidizing and ensure a quality product, top up your wine to minimize the air space above the wine. Our RJS development team are careful to ensure that the instructions and ingredients in every RJS Craft Winemaking kit deliver the best possible results. For any questions, contact us at 1 (800) 663-0954 or email at rjsinfo@cbrands.com.